For one- or two-semester junior or senior level courses in Advanced Calculus, Analysis I, or Real Analysis. This text prepares students for future courses that use analytic ideas, such as real and complex analysis, partial and ordinary differential equations, numerical analysis, fluid mechanics, and differential geometry. This book is designed to challenge advanced students while encouraging and helping weaker students. Offering readability, practicality and flexibility, Wade presents fundamental theorems and ideas from a practical viewpoint, showing students the motivation behind the mathematics and enabling them to construct their own proofs. William Wade received his PhD in harmonic analysis from the University of California—Riverside. He has been a professor of the Department of Mathematics at the University of Tennessee for more than forty years. During that time, he has received multiple awards including two Fulbright Scholarships, the Chancellor's Award for Research and Creative Achievements, the Dean's Award for Extraordinary Service, and the National Alumni Association Outstanding Teaching Award. Wade’s research interests include problems of uniqueness, growth and dyadic harmonic analysis, on which he has published numerous papers, two books and given multiple presentations on three continents. 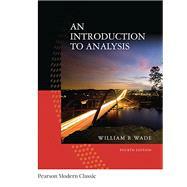 His current publication, An Introduction to Analysis,is now in its fourth edition. In his spare time, Wade loves to travel and take photographs to document his trips. He is also musically inclined, and enjoys playing classical music, mainly baroque on the trumpet, recorder, and piano.